Wedding games are the perfect way to get your guests mingling with each other. They allow different groups to interact, either through participation or as a talking point and ensure that your wedding will be memorable and fun. Adding wedding games to the itinerary doesn’t have to be difficult, particularly if you use these 5 classic wedding games. This is really easy to set up, and a good way to get the guests talking to each other. All you need are a few large whiteboards and you’re good to go. How to Play: Put hidden words on the giant board. Set a theme such as “finding the best honeymoon spots” or “things that the bride likes to eat” (the more humorous the better). Guests can be divided into groups in order to accommodate everyone. The first group to find all the words wins. Like the giant word search, this is also easy to prepare. Print several bingo cards without any numbers inside the boxes. There are a lot of wedding bingo card games on Pinterest that you can use if you need inspiration. How to Play: This follows the common bingo rules. For wedding bingo, the easiest card pattern to follow is a 90-ball bingo card. To the uninitiated, Foxy Bingo states that 90-ball bingo consists of a 3×9 table of numbers. Each line has 9 boxes, which display numbers. In wedding bingo, instead of numbers, questions about the bride and groom’s partnership are printed in each box. 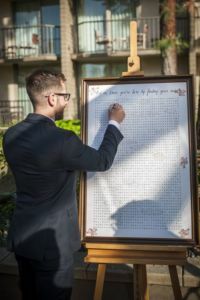 For example, the question can be “Who can play the piano between the two?” or “Where did they first meet?” Guests must write the answer in each box. Everyone will mingle with each other in order to find the correct answers. 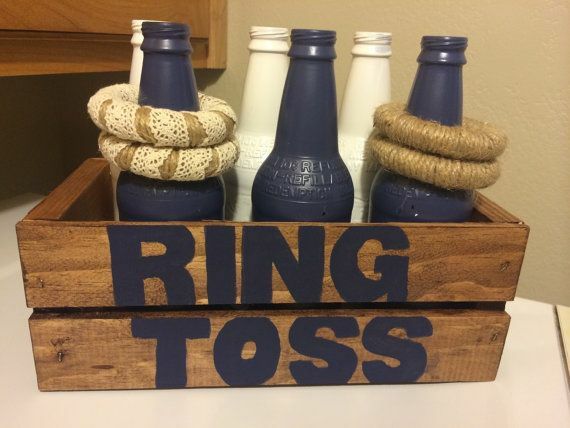 Honour the exchanging of the rings by adding a ring toss to your wedding. If you’ve ever been to a carnival, the ring toss game should be very familiar to you. How to play: Set up the bottles so guests can throw the rings onto them from a distance. This is a very simple game that will bring out the competitive side of the guests. A good way to get guests playing against people they don’t know is to create a mini-tournament. Arguably the simplest game to set up, yet also one of the most fun. This is another game to get the competitive juices of the guests running high. How to Play: Provide as many sacks as you can get your hands on, and get the guests to race. There are many different variations, and one way to get the guests to mingle is to create a relay event. 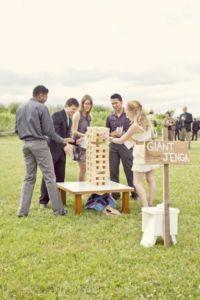 Nothing gets strangers closer than playing a game of Jenga, and you will want to get hold of a giant version of the game for a wedding. You can hire one or even make your own giant Jenga. How To Play: Giant Jenga follows the standard rules of Jenga, except the person who destroys the tower must suffer a consequence, which will be decided upon by the host. With these games, you’ll be able to entertain your guests and make your wedding much more memorable. If you are looking for ideas on where to have your dream wedding, Fantail Weddings published a list of 5 reasons to have a destination wedding. Check it out HERE for all the inside info.